I mentioned last week that we’ve been getting the Abel & Cole veg boxes. It’s always interesting to see what we get in these and figure out what to do with the various vegetables. It’s amazing the range of meals you can get from one box. 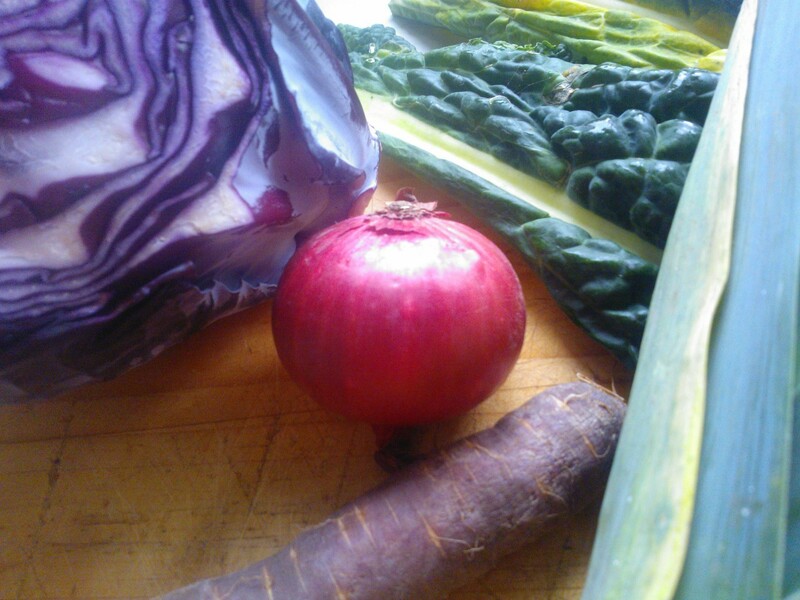 This week we had an appropriately seasonal combination of red cabbage, red onions, potatoes, leeks, cavolo nero, sprouts, purple carrots and a squash. *A delicious stew made by throwing into a slow cooker chopped onions, leeks, potatoes, purple carrots, sprouts, red cabbage and squash, topping up with water and a few gravy granules, and adding seasoning, a generous amount of red wine, rosemary, mixed herbs, and a dash of Lee and Perrins. I made dumplings by rubbing self raising flour and mixed herbs together with butter and then rolling the mixture into balls and putting them into the stew for the last half hour or so of cooking. *Fish cakes (not home made) with stir fried vegetables and sweet chilli sauce. For the stir fry I threw into a Wok red cabbage, red onions, leek, purple carrots and a little cavolo nero, all shredded/chopped relatively finely. I also boiled some noodles and put them in, and added a small amount of sweet chilli sauce. *Sausages, mash, cavolo nero, gravy and, the star of the show, one of my favourites, braised red cabbage! I used an Abel & Cole recipe using red wine, spices etc. which worked brilliantly! It is the best recipe I’ve found for this, and can be found here. I think other dishes we’ll be having with the leftovers are roasted squash, potatoes and red onions, pasta bake with leek, these cumin brussel sprouts, and maybe jacket potatoes with home-made coleslaw… There’s so much you can do with a box of veg! !